I’m just going to get right to the point here…this Stuffed Flank Steak Recipe was absolutely fantastic. I couldn’t believe it ended up being just 5 Points per serving! The flank steak is butterflied to create a thinly sliced piece of meat that is then seasoned and filled with fat free feta cheese, spinach and red bell peppers. When the steak is cooked, these delicious flavors come together for one seriously amazing piece of meat. My husband, the self-proclaimed Carnivore King, loved it, and no idea he was eating a relatively low calorie steak recipe. Plus, it looks lovely on a plate and would make a great Weight Watchers Recipe to serve at your next dinner party. I cooked my steak in the oven, but you could easily slice the stuffed steak into rounds and then grill, instead. This Stuffed Flank Steak Recipe is a definite keeper. This flavor packed steak of a traditional braciole, which is an Italian-American favorite. 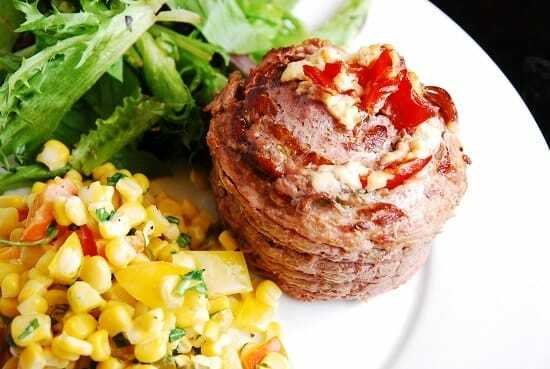 The meat is juicy and tender, and stuffed with a savory, low calorie filling. Steam your spinach leaves to wilt them. Tenderize your steak by butterflying or splitting the meat down the center so it lays flat and then pound it with a meat pounder, or mallet. Rub minced garlic evenly over the steak, and then sprinkle steak with salt, pepper and red pepper flakes. Layer the spinach, bell peppers and feta cheese onto steak. Then, starting at one end, roll the steak up like a big sushi roll, making sure to pull at the ends so it doesn’t get too thick in the middle. Tie it with kitchen string every couple of inches. Season with additional salt and pepper. Place in an 11” x 7” baking dish coated with non-fat cooking spray. Bake, uncovered, at 350° for about 45-50 minutes or until meat is tender, and until the internal temperature of the roll is at least 145 degrees F.
Remove from oven and allow it to cool for about 10 minutes before slicing it into 4, equally sized rounds. I made this last night and it was a HUGE hit!! My wife and son loved it!!! I love love love the idea… is there anything i can substitute in for the feta? Sure! you can do goat cheese, ricotta, or blue cheese instead. I love how easy, delicious and healthy a lean steak can be. I haven’t made flank steak in a while so thank you posting this. great dinner!!! thanks for sharing!